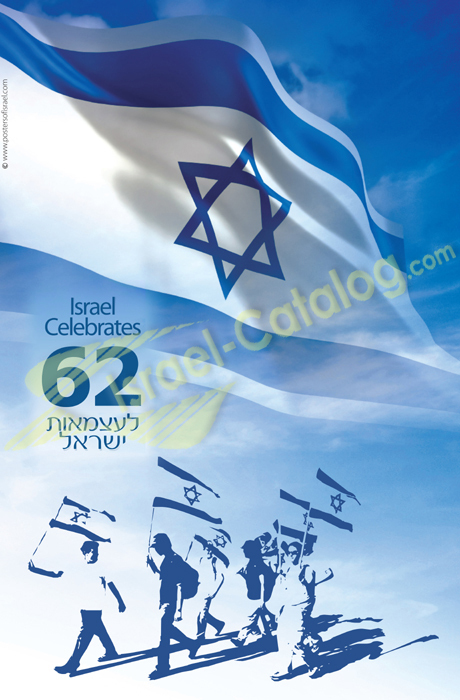 The design features a large Israeli flag against a blue sky above the words Israel Celebrates 62 in English and Hebrew. At the bottom are the silhouettes of several youths marching with Israeli flags. Product InformationPerfect for dressing up any wall, or instantly creating a theme for a room. Images look great on this high-quality poster, printed on heavyweight 7 mil semi-gloss paper using superior dye inks. Image size 16 X 20.